You are here: Home » Featured » Is NFP Effective? When the rules are followed, NFP can be 99 percent effective in avoiding pregnancy and works well to achieve pregnancy. 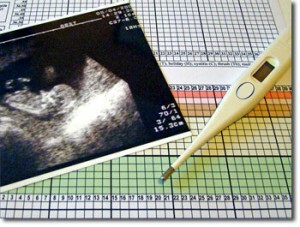 A brief overview of how NFP works: a couple charts the woman’s signs of fertility and determines when she is fertile. If the couple is avoiding pregnancy, they abstain from marital relations in the fertile time and only have relations in the infertile times (the average length of abstinence is between one and two weeks, depending on the couple). 1. The couple chooses not to follow the rules or they take “shortcuts.” On numerous occasions, a couple indicated that they were using NFP to avoid pregnancy, then they became pregnant. Upon questioning them, the couple shared that they had relations during the fertile time. “It was only one time.” One time is all is takes for a normal healthy young couple to become pregnant. 2. The couple chooses to use barrier methods in the fertile time. Couples who use contraceptive methods (condoms, diaphragm) during the fertile time may experience an unplanned pregnancy at some point if they continue contraceptive use. NFP’s 99 percent effectiveness rate depends on abstinence in the fertile time. If a couple does not abstain, the effectiveness rate will drop to whatever barrier they’re using. Contraceptive use is contrary to the teaching of the Church and is considered serious sin. 3. “We can’t abstain.” Abstinence is difficult. We don’t try to skirt the issue. But just because something is difficult doesn’t mean it’s impossible. A strong sacramental life is essential to assisting couples having difficulties with abstinence. 4. “My cycles are irregular.” NFP is not the old rhythm method. Most of the calculations and rules are based on a woman’s present cycle. Therefore, women with irregular cycles can use NFP effectively. As well, irregular cycles can sometimes be an indicator that something unusual is going on in the body. Improved nutrition, exercise and simple changes in lifestyle can often produce dramatic results. No method of birth regulation is 100 percent effective in preventing pregnancy. NFP is around 99 percent when the rules are followed and works well to achieve pregnancy too. Our own experience illustrates the effectiveness of NFP. My husband, James, and I were very young when we got married, so for the first four years of our marriage, we used NFP to avoid pregnancy. At the end of James’s last year of university, we decided to use NFP to seek a pregnancy. We became pregnant (with twins) in the first cycle. We unfortunately lost those babies early in the pregnancy. But over the next 25 years, we have been successful in avoiding pregnancy when we have had a serious need to do so; and equally successful in becoming pregnant when we have desired it (we have five sons ages 12-24). We were able to use NFP in the postpartum periods and have been able to use it effectively during pre-menopause. Ellen Gable Hrkach is the author of Come My Beloved, a book of real love stories. It can be ordered at Amazon.com or visit her website at http://www.comemybeloved.com .